StoryBoard is a project I started a few months ago. We have been running into a number of issues with Launchpad (inability to have blueprints spanning multiple code bases, inability to have flexible project group views, inability to use non-Launchpad OpenID for login…), and were investigating replacements. I was tired to explain why those alternatives wouldn’t work for our task tracking, so I started to describe the features we needed, and ended up writing a proof-of-concept to show a practical example. That proof-of-concept was sufficiently compelling that the Infrastructure team decided we should follow the path of writing our own tool. To be useful, task tracking for complex projects has to precisely match your workflow. And the POC proved that it wasn’t particularly difficult to write. Then people from HP, Mirantis and RedHat joined this effort. 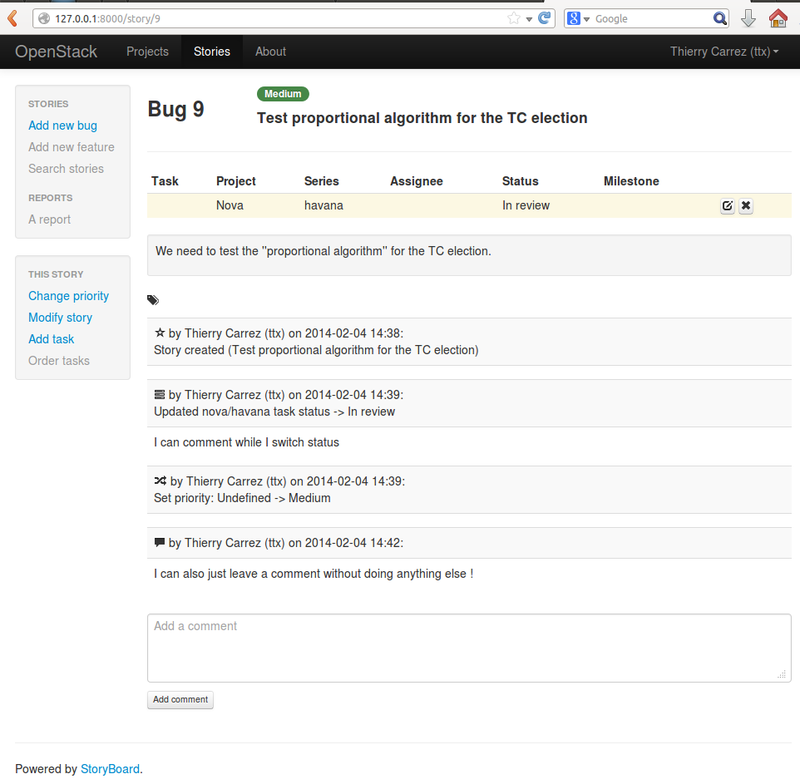 My Django-based proof-of-concept had a definite last-century feel to it, though. We wanted a complete REST API to cover automation and scripting needs, and multiple clients on top of that. Time was ripe for doing things properly and start building a team effort around this. Time was ripe for… the StoryBoard sprint. 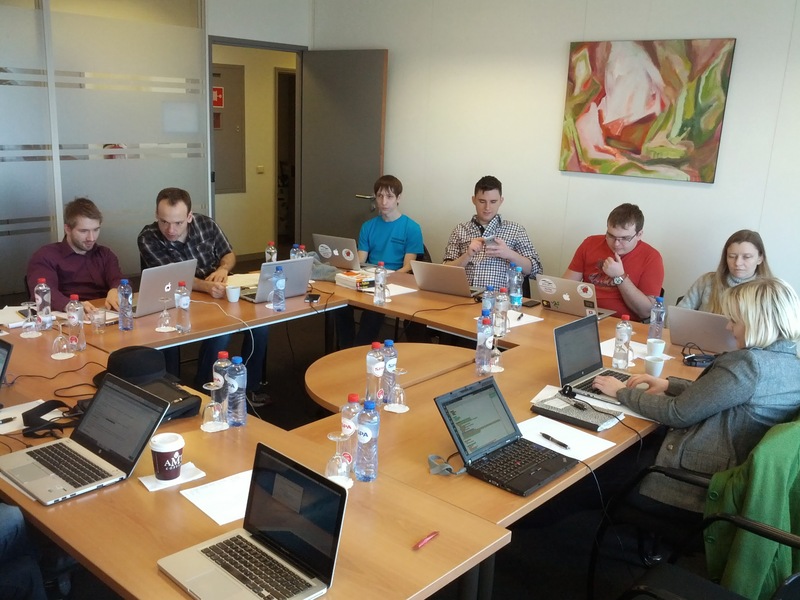 We gathered in Brussels for two days in advance of FOSDEM, in a meeting room sponsored by the OpenStack Foundation (thanks!). On day 2 we were 12 people in the room, which was more than we expected ! Colette helped us craft a mission statement and structure our goals. Michael presented an architecture (static JS client on top of OpenStack-like REST service) that we blessed. Jaromir started to draw wireframes. Sergey, Ruslan and Nikita fought uncooperative consulates and traveled at night to be present on day 2. We also confirmed a number of other technology choices (Bootstrap, AngularJS…). We discussed the basic model, bikeshedded over StoryBoard vs. Storyboard and service URLs. We got a lot covered, had very few breaks, ate nice food and drank nice beer. But more importantly, we built a strong set of shared understandings which should help us make progress as a united team going forward. We have automated testing and continuous deployment set up now, and once the initial basic functionality is up (MVP0) we should iterate fast. The Infrastructure program is expected to be the first to dogfood this, and the goal is to have something interesting to present to other programs by the Atlanta summit. To participate or learn more about StoryBoard, please join us on #storyboard on Freenode IRC, or at our weekly meeting.